July 11th 1940; World War One hero Henri Petain becomes head of the collaborative Vichy government of France. Petain was a national hero in France for his role in the defence of Verdun in World War One, but was later discredited and sentenced to death as head of the French collaborationist government at Vichy in World War Two. In May 1940, with France under attack from Germany, Pétain was appointed vice premier. In June he asked for an armistice, upon which he was appointed 'chief of state', enjoying almost absolute powers. The armistice gave the Germans control over the north and west of France, including Paris, but left the remainder as a separate regime under Pétain, with its capital at Vichy. Officially neutral, in practice the regime collaborated closely with Germany, and brought in its own anti-Semitic legislation. In December 1940, Pétain dismissed his vice-premier, Pierre Laval, for his policy of close Franco-German collaboration. But Laval's successors were unacceptable to the Germans and Laval was restored. In November 1942, in response to allied landings in North Africa, the Germans invaded the unoccupied zone of France. 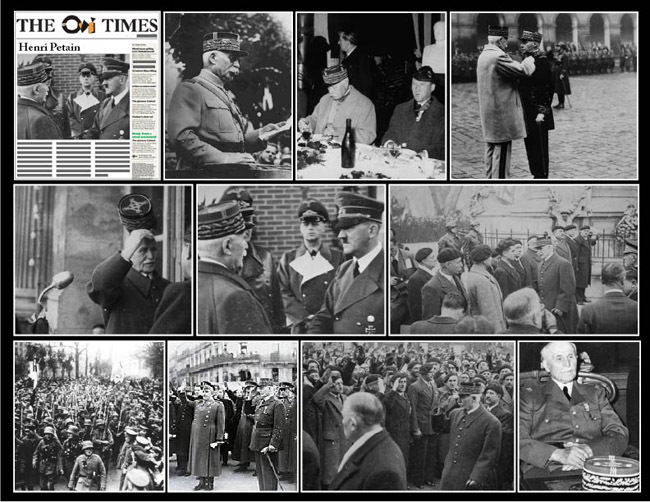 Vichy France remained nominally in existence, but Pétain became nothing more than a figurehead. In the summer of 1944, after the allied landings in France, Pétain was taken to Germany. He returned to France after liberation, was brought to trial and condemned to death. This was immediately commuted to solitary confinement for life by General Charles De Gaulle. Pétain was imprisoned on the Île d'Yeu off the Atlantic coast, where he died on 23 July 1951.